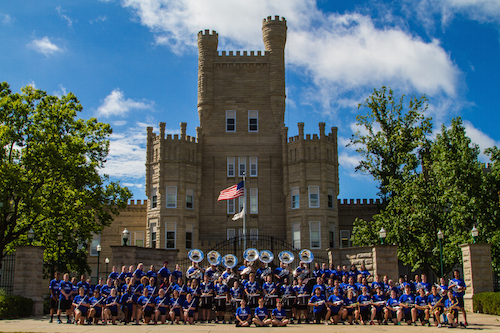 The Panther Marching Band is the sound and spirit of Eastern Illinois University! Whether before, during or after the game, the Panther Marching Band strives for excellence as we support our athletic teams, entertain our fans, serve as ambassadors for our university, and inspire joy as we uphold the traditions of EIU. Known for energizing audiences throughout the Midwest, the PMB regularly supports many local and regional events and are privileged to be an important part of EIU and Charleston, IL. The PMB is one of the largest, most visible, and exciting organizations on campus. We are also one of the most diverse, with students representing nearly every academic discipline at EIU. Membership is open to all EIU students who play a band instrument. Come be a part of this exciting organization! Get more information here! Scholarships for 2019! We Still Have Awards Available! The Panther Marching Band is excited to offer $10,000 in scholarships to first-year students, including first-year transfer students, who march with the Panther Marching Band in the Fall of 2019. Students must be non-music majors and play woodwind, brass, or marching percussion instruments; or they must participate in the Color Guard. Music minors are still eligible and are strongly encouraged to apply. Awards are based on the needs of the ensemble and are at the discretion of the Assistant Director of Bands and Director of Bands. Woodwinds and Brass players must play 1 major scale (2 octaves where possible) and a 1 minute musical excerpt. You are free to select whatever scale and excerpt you prefer. Percussionists must play a double stroke roll, paradiddles, a buzz roll, and part of a drum cadence. Students interested in color guard must complete the application and attend the Color Guard audition day on campus on April 13. Click on "Auditions" above for more information about the audition process. Scholarships will be awarded on a rolling basis. Questions? Email Dr. Benjamin James Druffel, Panther Marching Band Director, at bjdruffel@eiu.edu.